The Windows 10 October 2018 update (version 1809) is the latest feature update for Microsoft’s Windows 10. Codenamed ‘Redstone 5’, the update comes with many innovative features, apps, and improvements that aims to bring a brand new experience to the Windows 10 operating system and all Windows PCs at large. The update is now rolling out to Windows PCs worldwide but before you upgrade to the latest release, we thought it would be best if you knew what to expect in terms of new applications, features, and improvements. So, the headers and paragraphs below highlight 10 major enhancements of the Windows 10 October 2018 update. For lovers of dark themes or dark backgrounds, File Explorer will now features a dark theme when Dark Mode is enabled in the Settings menu. This isn’t the first time Dark Mode will be on Windows 10 though, it’s just the very first time it’s getting incorporated into Windows File Manager (with the October 2018 update) to make the Dark Mode a complete package. 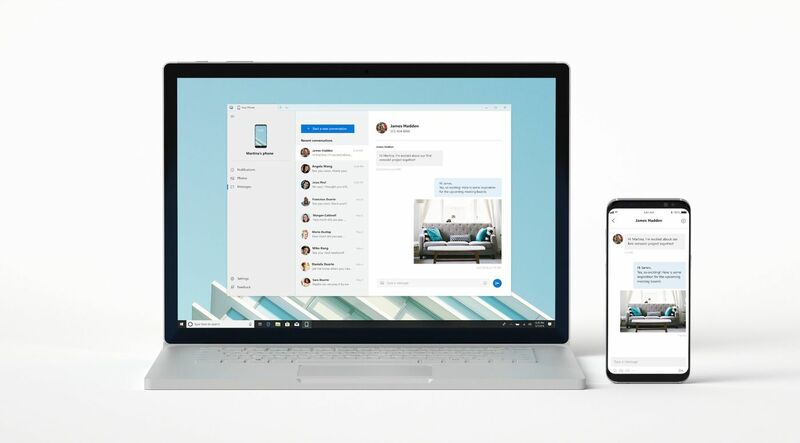 On the Windows 10 October 2018 update, there is a new “Your Phone” app that allows users’ smartphones interact better with their Windows 10 PC. Pinned to the desktop by default, the Your Phone app allows easy transfer of files and media from your phone to anywhere on your PC or a document you are currently working on, sync photos, and send text messages directly from your Windows 10 PC. Presently, the Your Phone app will only work with Android-powered smartphones; support for iOS devices will come at a later date. Storage Sense is a new feature in the Windows 10 October 2018 update that will automatically help free up hard drive space on your PC by deleting file that you don’t use no more on your PC and back them up on OneDrive. The feature doesn’t come automatically activated with the update. To use Storage Sense, users will have to turn it on manually in the Setting menu. Although it’s an optional addition, it poses as a great tool for storage optimization and management. So far, Cloud Clipboard is arguably one of the best new feature of the Windows 10 October 2018 update. 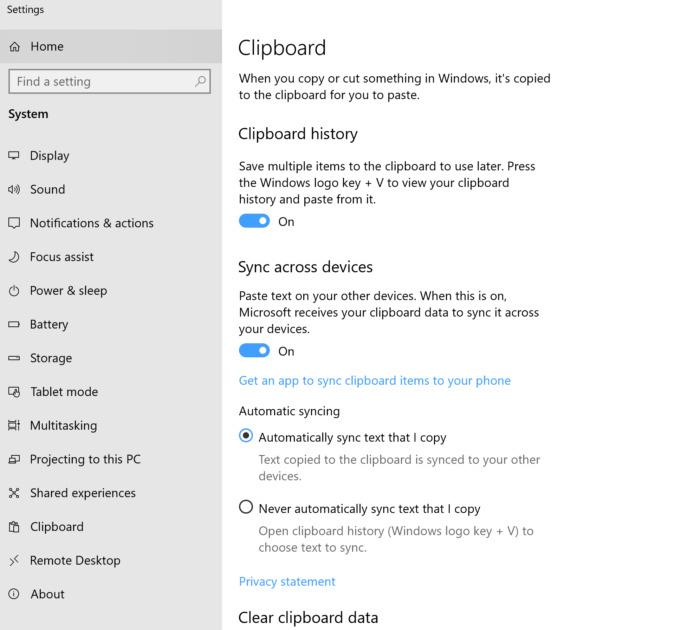 Cloud Clipboard basically allows you access your PCs clipboard history on other Windows 10 devices. Say you use a Windows 10 desktop work, and you copied a bunch of work stuff to your clipboard, you can access your entire work clipboard history on your Windows 10 laptop at home. The Windows + C keys trigger the cloud keyboard function while on the other Windows 10 device, pressing the Windows + V keys displays the copied clipboard contents. Syncing contents using Cloud Clipboard is currently available across Windows 10 devices only but Microsoft says support for Android and iOS devices will be coming later in the future. The company mentions that it is working to incorporate cloud clipboard support to SwiftKey (a popular keyboard application for Android and iOS devices) for syncing clipboard contents with non-Windows mobile devices. You should also know that in the new Win10 update, SwiftKey now powers the virtual on-screen and touch keyboards. On the new Redstone 5 update, Screen Sketch is now a standalone app and a more powerful screenshot tool. The app can be activated using the Windows + Shift + S keys shortcut. This then triggers an area select tool to snip out a screenshot and even drop comments (annotations) on it before saving or sharing it. Alternatively, the Print Screen key can also be configured to launch the Screen Sketch screenshot tool. If you upgrade to the October 2018 version of the Windows 10, you will be able to choose between three presentation modes when projecting your device’s display wirelessly. The available modes are Game mode, Video mode, and Productivity mode. 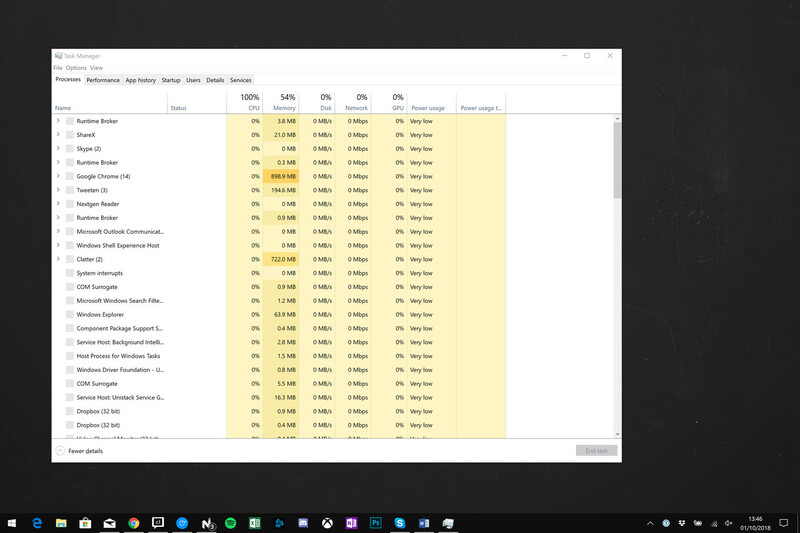 Task Manager in the Windows 10 October 2018 update comes with a newly added “Power Usage” and “Power Usage Trend” columns. The tabs help users categorize apps on the basis of Power usage to help users easily identify apps draining their device’s battery juice and close them accordingly. Users will now be able to increase text size across the operating system in its entirety. This system-wide text size modification will allow users with visual difficulties see text more clearly. Text adjustment can be achieved through a new settings option in the new Windows 10 October 2018. The Windows 10 Game Bar will now display CPU and GPU usage, as well as average frames per second (fps) used during gaming. The Game Bar also features improved audio control. Microsoft Edge now comes with more appealing interface, redesigned tabs and new tools. In addition, users can now restrict websites and videos from auto-playing sound, use the new “Reading View” themes for improved reading.